The name Paris is often associated with the luscious baked goods and pastries – it’s heaven for every sweets lover in the world. Allow some indulgence without fear, live life to the fullest while in Paris, and then walk off all the extra calories. After all, the City of Lights is made for walking and taking in all the sites. Visit these 12 pastry shops in Paris and enjoy the sweet life, if only for a short while. This shop is often the first thing on the mind of many visitors, and for a good reason. The place is beautiful and insanely tasty. Pastel colored macaroons are to die for and should be enjoyed on the romantic banks of Seine. One bake shop is on Rue Bonaparte and another on Champs-Elysees. The later one has fantastic terrace made to relax and indulge in Religieuse and Saint-Honore chased down with Marie-Antoinette tea. This little cozy pastry shop is located in the Latin Quarter along an old cobblestone street. The shop specializes in signature choux a la crème. The little cream puffs are cute and insanely delicious. They are so weightless and fluffy that it’s hard to know when to stop eating them. Have a couple or ten of them in the attic-like second floor while marveling at Notre Dame through the window. The shop is visually stunning – natural light floods in through tall windows, while exposed light bulbs project even more magic on already magical sweet treats. The décor is completed with marble tables and pastel blue colors all around. Take a seat and indulge in wonderful patisseries. And take something along for all the walks you are going to do through the city – caramel au beurre sale are spectacular! This chef is a master at flavor combinations – unusual mixes and pairings are always unexpected and perfect. It turns out vanilla goes beautifully with olive oil and chocolate pairs phenomenally with foie gras as long as perfect ingredients are combined without fear. All you need to do is keep your mind open and options endless. The flagship store is just a step away from tranquil Place Saint Sulpice square – perfect spot to enjoy the creations of Pierre Herme. And don’t leave the store without the best in town macaroons. The hot chocolate is luxurious here. A cup a emporter is phenomenal and is meant to be sipped slowly on a cold winter afternoon. The deco of this baking goods heaven is a point of interest in its own right – it is more of a chateau than a tea room. Especially adventurous sweets experts are to try mont blanc with their chocolat chaud and try to survive this delicious death by chocolate. Crave a Japanese touch to put a modern twist on French sweets? Then head right to Sadaharu Aoki. Here you will find yuzu and matcha touches on his creations and will fall in love with wasabi flavored macaroons. The tea room is modern and minimalistic – let the scent and mood of the beautiful pastries speak for themselves in this tranquil atmosphere. This is a place where all your sweet dreams come true – the patisserie is decorated with heavenly pastries hanging down from the ceiling in little glass domes. This is the case when there is no need for art. The Paris-Brest is the most famous here, so don’t leave without trying it, after indulging in everything else first. It looks like the store serves the most beautiful kind of cupcakes – complete with cute white paper and intricate cream tops, but it’s actually so much more than that. The little creations are masterful handcrafted patisseries, so truly French. The bakery is run by two women and features everything from the Saint-Honore to the Tarte au citron. And all little masterpieces come looking like tiny cupcakes – big on taste and small enough to leave space for more. This is where the éclair is reinvented and beautifully updated the French way that improves everything. And suddenly the éclair is more fashionable than macaroon. The eclairs resemble little jewels and are mouth-watering with a great gamut of flavors – from enticing yuzu lemon to passion fruit and raspberry. Christophe Adam always keeps her creations fresh and updated with seasonal flavors and tastes. This culinary heaven only serves one kind of creation – heart shaped meringue pastries are connected together with sinfully good whipped Chantilly cream and then rolled in flaked chocolate. The chefs create their masterpieces behind a window, so you can watch the birth of these treats. Incroyable flavor adds another tone of wonderful as it is made with crushed speculoos biscuits and elevates this dessert one level higher. The bakery sells cake and bread, as the name suggests, but also offers so much more. Check out the wide selection of incredible patisseries so invitingly displayed. Locals love to have breakfast here, signature fresh baguettes, melt in your mouth croissants, and heavenly pastries. 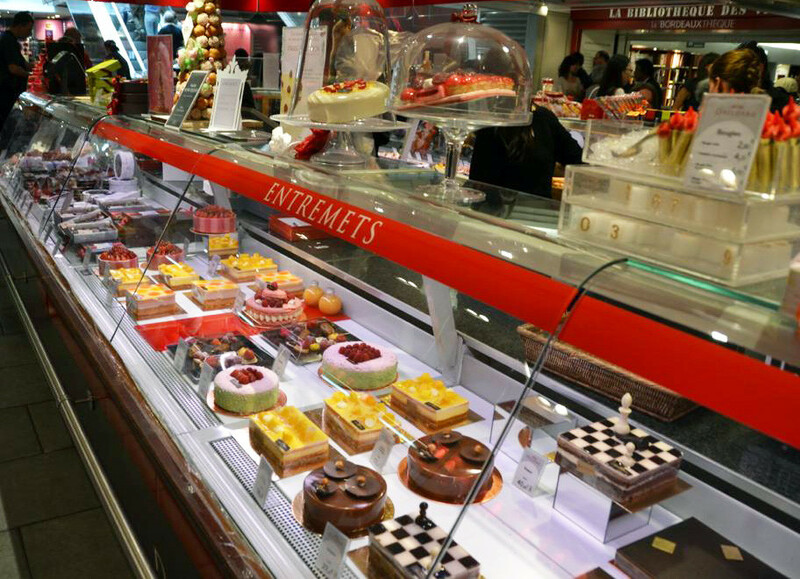 The café is located in the department store Printemps - who doesn’t need a little sugar intake during the shopping spree? The café entices with sophisticated interior and tempting pastries, masterfully crafted to perfection. Russian influence is heavily felt here and such tasty staples as multi-layered honey and cream cake medovnik are available.